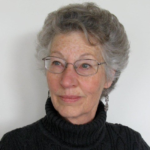 Mary Makofske is a poet, prose writer, and teacher, author of four poetry books. The latest is World Enough, and Time (Kelsay, 2017). Her third book, Traction, won the Richard Snyder Prize from Ashland Poetry Press and was published in 2011. She was a professor of English at SUNY Orange until her retirement in 2006. Before her academic career, she worked as a travel agent, reporter and feature writer, and health educator. She was born and grew up in Washington, D.C., attended Douglass College (B.A., English) and the University of Minnesota (M.A., English), and has lived in New Jersey, Minnesota, England, Illinois, and New York State. She has two sons and four grandsons and currently lives with her husband in a solar house with a large garden. In addition to writing, she volunteers with political and environmental organizations.